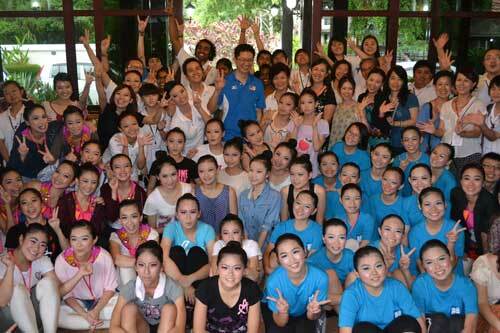 SWEET MEMORIES: A section of the 12 dance troupes taking part in the recently-concluded Sibu International Dance Festival pose for a group photograph with Cr Robert Lau Hui Yew (standing centre, in blue t-shirt). Lau, who was the advisor of the festival, hosted a gathering for them on Saturday afternoon. SIBU: Local dancing troupes can learn a lot from the recently-concluded Sibu International Dance Festival. This is because they can pick up new dancing skills from troupes from Singapore, Indonesia, Kuala Lumpur, Johor and even Taiwan and Sri Lanka participating in the event, opined local Hornland Dance Theatre (HDT) artistic director Chen Ing Kuan. “Such uniqueness was produced out of the participating groups’ creativity which we tried to bring out in organising the festival. “Through such arrangement, the participating groups could share their knowledge with each other,” he said. Chen gave this opinion when interviewed by local media at a party hosted by Sibu International Dance Festival advisor Cr Robert Lau Hui Yew to fete the 12 dancing troupes participating in the festival on Saturday afternoon. Sibu International Dance Festival, which was organised by HDT in collaboration with Sibu Municipal Council, was held for four nights from Aug 22 to 25 with a total of 46 dances presented. In addition, he said, there were also seven dance workshops and four dance seminars where participants shared ideas and knowledge. He believed that local dancers would learn and acquire new skills if the dance festival could be held regularly, like once every two years. “If we can organise the dance festival on a bigger scale in future to draw in more participating groups especially from outside, benefits gained might be more obvious. “However, this could only be done through the gradual accumulation of organising experiences,” he pointed out. Although eight groups from outside Sibu participated in the inaugural festival, a group from Hunan Province of China had to pull out due to prior engagement to perform at a bigger event in their province, he disclosed. He also said besides being joined by four local dance groups, the event saw some 150 dancers taking to the stage. Meanwhile, Lau commended Chen for organising the event which had spurred interest in performing arts in Sibu. To Lau, dancing might not be a good way to rake in money but the satisfaction it brings to the dancers is something that cannot be bought.